There is some confusion over the White Holland Turkey; though many white turkeys are known as White Hollands, not all truly meet breed standards. True White Holland Turkeys are becoming rather rare, and conservation efforts are needed to preserve it. 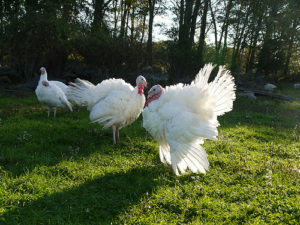 White Holland Turkeys are no longer commonly raised in captivity. Breeders of the true type are rare, and express a concern that, when shown, White Holland Turkeys are judged on standards that are slightly removed from those of the true breed. For this reason, most White Holland Turkeys are raised only by enthusiasts, and may not be widely shown. A type of White Holland Turkey is also raised commercially. The true White Holland Turkey had blue eyes, though today many White Holland varieties, crossed with colored turkeys for greater hardiness, have brown eyes. Some male White Holland Turkeys also have black beards. The throats and wattles of White Holland Turkeys are pinkish white, as are the toes and shanks. The beaks are also sometimes pink, but are otherwise horn colored. The heads of White Holland Turkeys are tinted with red or blue. The rest of the Turkey is covered in pristinely white feathers. 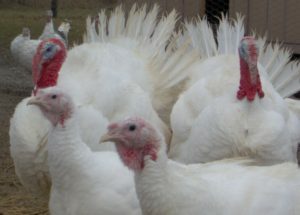 Today some varieties of White Holland Turkeys that have been crossed with Large Whites have broader breasts and shorter legs than the original, rare variety. 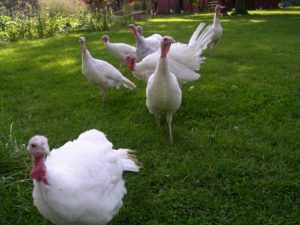 Purebred White Holland tom turkeys usually weigh about 33 pounds, and females, or hens, weigh around 18 pounds. It is believed the White Holland Turkey developed in Holland, though this is not certain. Wild Turkeys imported to Europe from the Americas were bred in many countries, though Holland and Austria tended to favor white varieties. One of these was the White Holland Turkey, first brought to the United States and Great Britain in the early 1800’s. By 1874, a breed standard was in place. 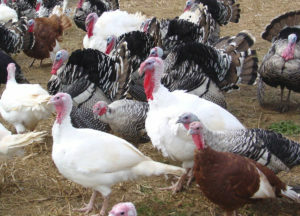 Today, commercially raised White Holland variety Turkeys are one of the most popular types sold during the winter holidays in the United States of America. 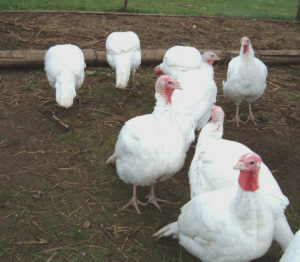 However, most of these are not true purebreds, and White Holland Turkeys have become rather rare in the purebred form. Care for White Holland Turkeys is similar to that of other Turkeys. Because of their large size, these birds should be allowed plenty of space to move about. Purebred White Holland Turkeys are difficult to find and rarely bred. Unlike commercially bred White Holland types, true White Holland Turkeys do not require artificial insemination for breeding.